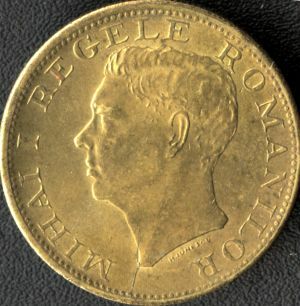 denomination "500 LEI", year 1945, Romanian coat of arms, outer pearl circle inscription "MIHAI I REGELE ROMANILOR" meaning "KING OF THE ROMANIANS", MIHAI I head facing left, outer pearl circle. Under the neck lies H. IONESCU, the engraver's name. 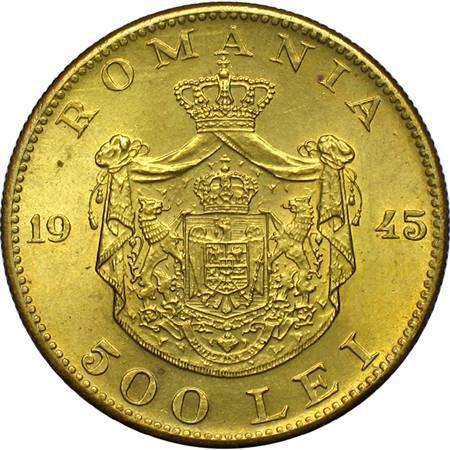 The pictures of 500 lei 1945 are present on Romanian coins through the kind permission of an anonymous donor. According to the information from the book Monetele României (Iliescu and Radovici, 2004), the 500 lei 1945 coins were struck in 4.942.400 pieces. Several Romanian coins enjoy a number of variants, making the coin collecting time more pleasant. Unfortunately, many of their peculiarities are but lesser importance, superficial nature details that are often due only to matrix imperfections. Even so, they are priced twice as the average or better yet. Below we display such a variant, not previously known to the Romanian numismatic literature. 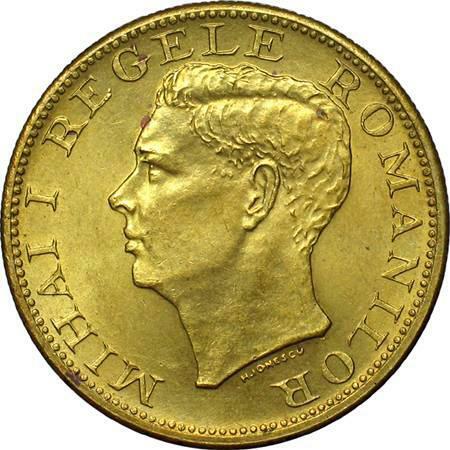 It belongs to the 500 lei coin struck in 1945 (under Michael I). As seen (on the two images above), on the lower region of the reverse (the side with king's effigy), a criss-crossing hair embossed for over a centimeter out of the normal relief of the coin. It starts at the right of letter M and continues past the intersection with the neck of the effigy. The most probable the matrix cracked while striking, allowing for a quantity of material to go in it and thus being added over the normal surface. Several pieces of this variant must have been struck. Honestly speaking, such coins are sheer flaws, yet their quotation proves a real interest from the numismatists. The 1 leu of 1873 with broken L is an example, the same for the 1 ban of 1900 with imperfect R and the 2 bani of 1882 with various incomplete letters. In which concerns the 2 bani coin of 1900, there are two variants characterized by the presence of a hair (usually called branchlet). Variant 29b has such a problem starting at the penultimate 0 of the year and going past the wheat ear, and variant 29c starting at letter N of ROMANIA and reaching the penultimate 0 of the year (classification was made accordingly to the Bible of Romanian numismatis, Monede şi bancnote româneşti de George Buzdugan, Octavian Luchian and Constantin Oprescu, 1976).